Just because you are a man who is larger than normal does not mean you have to pay a larger amount for condoms that fit. Maybe you already have a favourite or maybe you have tried other brands you liked but felt they were too expensive. 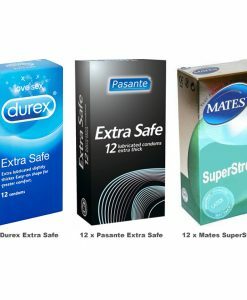 All Condom has made it easier than ever to purchase large size condoms at a value price. 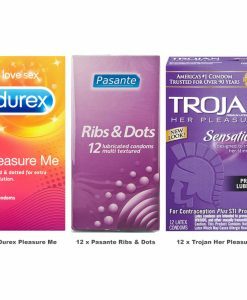 In this proprietary bundle you receive a dozen each of some of the sites most highly rated condoms. At the rate these sell, too many men can’t be wrong at the same time. 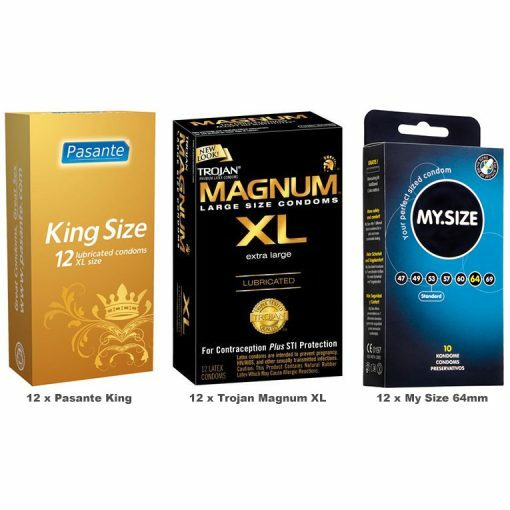 12 x Pasante King Size Condoms – These have been made wider and longer than standard condoms to provide extra comfort to those who find regular condoms too tight or too short. They have a regular shape with a reservoir end. 12 x Trojan Magnum XL Condoms – This condom has been designed for those men who feel that regular or even larger-sized condoms are too small. Magnum XL’s are a generous 30% larger than a standard condom. They are tapered at the base for a secure fit. A silky smooth lubricant provides comfort and sensitivity. 12 x My Size 64mm Condoms – My Size 64mm are the second-largest condoms in the world. If you’ve tried the Trojan Magnum XL and the condom was too tight around the base, the My Size condom may fit the bill. The 64mm condom is longer and wider than the Magnum XL, allowing the larger gentleman much more comfort and greater sensations.